Make the most of your time in Playa del Carmen and combine two adventures on one tour. 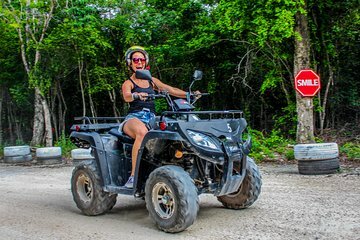 First, hop on an all-terrain vehicle to explore the Mayan jungle. The tour takes place on a private circuit and is supervised the entire time. Learn about the flora and fauna of the ecosystem and admire the lush tropical landscape. Then, ride to an incredible cenote filled with stalactites and stalagmites. Cool off in the refreshing waters before heading back with your new memories of this Mayan landscape.